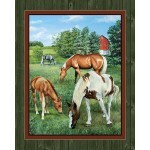 Happy Trails Horses Frames Cotton.. Happy Trails Horses Scenes Cotton.. 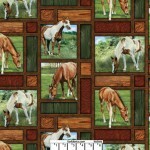 Horse Breeds Cream cotton fabric panel features the following horse breeds, Rocky Mountain Horses, A.. Horse Breeds Rows Blue Cotton Fabric features the following horse breeds, Rocky mountain Horses, And.. 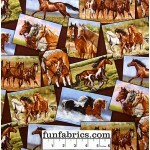 Horse Breeds Rows Cream Cotton Fabric features the following horse breeds, Rocky mountain Horses, An..
Wild Prairie Grass Landscape Medley Golden Wheat Grass Cotton Fabric is a nice print that depicts go..
Rivers Edge Horses Cotton Wall Panel, Fabric for quilting, sewing, home decor and craft projects, Cr..
Rivers Edge Horses Cotton Pillow Panel. Each picture is about 15" square. Border is about 3" tall. 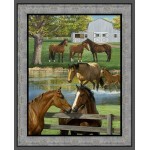 ..
Summer Breeze Horse Cotton Panel. Fabric for quilting, sewing, home decor and craft projects. Print ..
Summer Breeze Horse Cotton Pillow Panel. Each picture is about 16" square. Border is about 2 1/2" t..
Sweetwater Bridge Horse Scenic Cotton Fabric, Fabric for quilting, sewing, craft and home decor proj..
Valley Crest Horses Cotton Wall Panel, Fabric for quilting, sewing, home decor and craft projects, C..
Wild Wings Valley Crest Horses Frames Cotton Fabric, Fabric for quilting, sewing, craft and home dec..
Wild Wings Rivers Edge All Over Horse Cotton Fabric, Fabric for quilting, sewing, craft and home dec..
Wild Wings Rivers Edge Scenic Horse Cotton Fabric, Fabric for quilting, sewing, craft and home decor..
Wild Wings Summer Horse Scenic Cotton Fabric, Fabric for quilting, sewing, craft and home decor proj..
Wildflower Trails Horses Scenic Cotton Fabric, Fabric for quilting, sewing, craft and home decor pro..